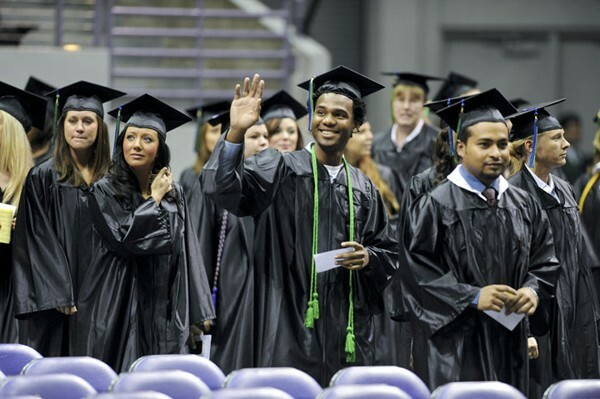 The University of West Florida held its fall commencement on Saturday, Dec. 10, graduating more than 1,000 students. Graduates young and old fought the cold, biting wind as they excitedly entered the Pensacola Civic Center to receive recognition for their accomplishments. The joint commencement honored both graduate and undergraduate students. The room was full of proud parents, celebratory friends and the supportive faculty and staff who made the day possible. Tammy Slay, the mother of one of the graduates, could not have been more proud of her son, John. “Pomp and Circumstance” played loudly as students filed in—first the doctoral and specialist candidates, followed by the graduates and undergraduates of the College of Business, College of Professional Studies and the College of Arts and Sciences. Many students who graduated are planning to return to UWF to further their education and obtain post-graduate degrees. Students from all walks of life were represented at the ceremony, from traditional to non-traditional, international and distance learners. Caitlin Mayes, a health sciences graduate, said she could not have earned her degree without the convenience of online learning. The ceremony welcomed keynote speaker K.C. Clark, senior vice president of Raymond James & Associates, Inc., who challenged graduates to encounter the fork in the road with confidence and be proud of who you are. UWF President Judith Bense and SGA President Josh Finley also spoke to the graduates about the importance of the next step in life. Additional speakers included alumnus Wayne Williams, Dean of Graduate Studies Richard Podemski, Dean of the College of Business Ed Ranelli, Dean of the College of Professional Studies Pam Northrup, Dean of the College of Arts and Sciences Jane Halonen and Board of Trustee Chair retired Gen. Charles Horner. To view pictures of the ceremony, click here.